Todays card is for the 2RedBananas Challenge. This week we were to use ribbon! Love ribbon. I wasn't sure about my color combo but it's growing on me. I had the image colored first so that limited me and made it harder on me i think. This is the first time I've used Apricot Appeal! I really like this inkadinkado stamp. Very pretty card! I love the purple/orange combo. The image is awesome too. Thanks for playing in 2RB's challenge. Love the color combo, beautiful Janice!! Hey, I LOVE the look of this color combo. Beautiful card! 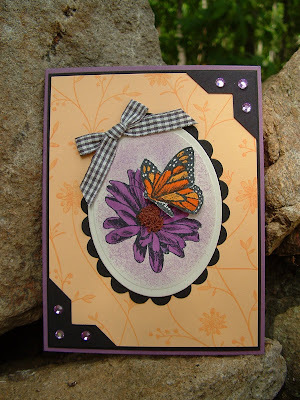 I love this color combo too :) Very elegant card! Thanks for playing along in the 2RedBananas challenge.